In this process the upper is attached to the insole by cement , the lasting margin is roughened. The sole is attached with lasted upper by means of adhesive. The result is the permanent bond between three elements( upper, insole, sole). There is no stitch. Many women and children shoes along with a large number of men’s dress and casual type of shoes are made in this process. 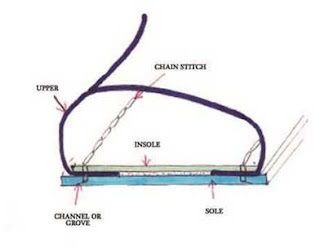 This is a direct method of attachment of sole to the upper by stitching. After flat lasting as for cemented, the sole is temporarily attached by adhesive, the last is slipped and the sole is stitched to the upper through the insole forming a series of loops. The chain stitches are hidden in the groves of the sole. The method is very much easy to identify. The seam or loops of stitch can be seen in the inside, if the sock is lifted. Find Your Favorite Running Shoes.